I have an idea of who the maker, assayer and etc are from the hallmark indexes on this site, but an expert identification would be very much appreciated. 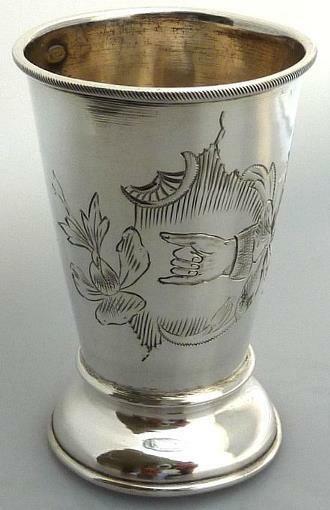 the maker of this stopka (Kiddush cup is pure nonsens - again and again told from stupid dealers to stupid customers!) is Dmitriew Michail, 1854-1877. Is it an illusion, or are the hallmarks struck prior to the maker's mark being struck? Thank you Zolotnik. 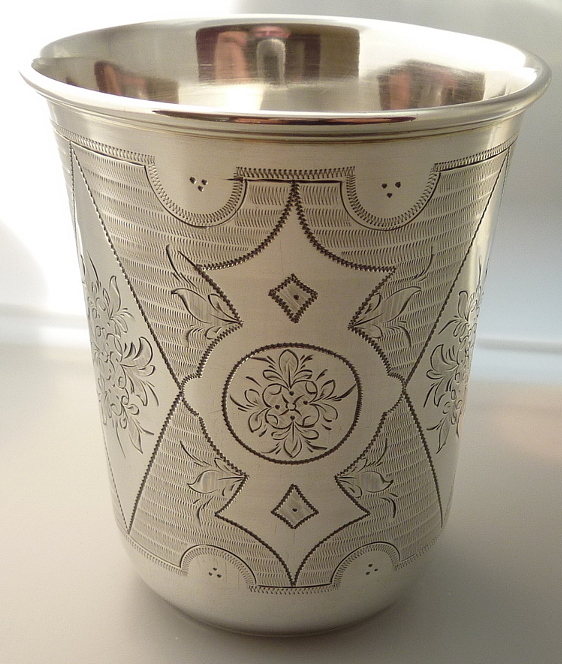 Kiddush cup was the term used by the American jewish gentleman that sold the cup to me. I'm sure he didn't intend to disguise it's name. His price was tied to this "stopka's' scrap value. Is there a way to distinguish a stopka from other similar cups? of course is there a way to distinguish a stopka (shotglass) from a rjumka (shotglass with a foot) or stakan (beaker): form, size and use. There are several more other drinking vessels (tscharka, kovsh etc). There is no question that the makers mark was done after the hallmark. It doesn't show up well in the image, but the rectangular cartouche for the maker's mark overlaps the hallmark. I shall have to remain in my stupor when it comes to properly identifying these cups, but I will say that those are beautiful examples you have shown. Great images. 1. It is an imported item brought by the Russian customs to the assaying office to be tested, approved and marked. Then the importer has struck his (retailer) mark on the object. This was not an unusual procedure. In 1871 there were no special import marks used. 2. It is a spurious object. Zolotnik is right in calling it "stopka" rather than "kiddush cup". Dealers prefer to call them "kiddush cups" because it sounds more fancier and attracts more customers as well as the price can be put higher. Judaica objects are currently popular collecting objects. 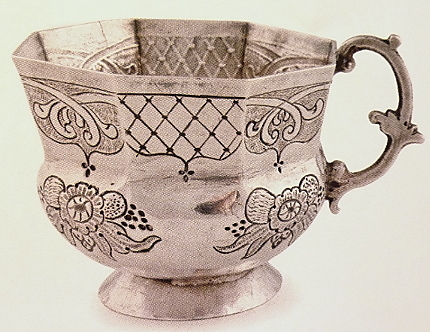 The most of such cups are ordinary Russian vodka cups (stopkas) only. Just a thought, but the stopka appears to also have a makers mark on the rim as shown in picture 1 - maybe the maker later added another on the base with the main hallmarks added by the assayer? Also with regard to stopka vs. stakan... A stakan is much bigger than a stopka! I'm back to the old post with the question. Can I ask you to put the STOPKA, RJUMKA and STAKAN examples again. The photos are not visible. why reading books - ask the forum! Here some of the common drinking vessels - different materials are possible (enamel, laque, niello etc). Definitions are not strict and even Russian links are not consistent or definitions are rather vague. Etymology from old volume measure (Как единица объёма). Seems related to the volume, not the form (compare with shot glass). (Стака́н — сосуд, близкий по форме к цилиндру, без ручки). Usually used for strong spirits, it is small in size, has no stem. A native Russian speaker can hopefully shed more light. The image is from a Russian link described as rjumka.